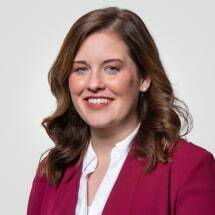 Jessica is an Associate Attorney at the McArthur Law Firm. Jessica focuses primarily on helping clients who have been injured in car wrecks, truck wrecks, slip and fall cases, dog bite cases, and other injury cases. From a very young age, Jessica's relationship with her grandfather, a Judge Advocate General for the U.S. Marine Corps and former prosecutor, exposed her to the importance of seeking justice for all individuals and what it means to help people. Jessica comes from a military family, but was primarily raised in Warner Robins, Georgia. Jessica graduated from the University of Georgia in 2010 with a Bachelor of Arts degree in International Affairs. From there, she moved back home to attend Mercer University's Walter F. George School of Law. Jessica's main goal is to seek justice for those who have been injured through no fault of their own. Jessica is a key member of the firm's trial team where her legal knowledge, use of technology, and prepardedness allow the client's voice to be heard. Jessica lives in Macon with her husband, Nate and their daughter. Set up your free consultation with Jessica today to hear how she will fight for you!